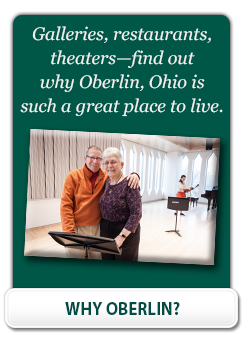 Kendal at Oberlin is a nonprofit Ohio corporation, governed by a board of directors. Board members are dedicated volunteers, and include both Kendal residents and a wide range of professionals from our local area. Independent fiber artist and owner of Ginko Gallery and Studio, LLC, in Oberlin; Former Director of Community Support Services, W. G. Nord Community Mental Health Center; Volunteer board/committee member of Bonner Center for Service and Learning, Bill Long Foundation, Main Street Oberlin, Textile Art Alliance (Cleveland Museum of Art), and FAVA. Diplomat of American Association of Pastoral Counselors; Former Director of Training, Lloyd Center, San Francisco Theological Seminary; Former parish pastor in California and New Jersey. Board member, Oberlin Heritage Center, Bill Long Foundation; VP Emeritus for Public Affairs, Case Western Reserve University; Past board member, Hiram College and the Friends of the Cleveland School of the Arts; Managing Director, Management Assistance for Nonprofit Organizations (MANA); Author, History of Kendal at Oberlin (2013) AND History of Case Western Reserve University (2014). Head of Strategic Marketing Research, DST Systems, Inc.
Human Resources Manager, Agrinomix, LLC Oberlin; Member of Kendal at Oberlin’s Human Resources Committee since 2003. Team Lead Coordinator, Provider Operations for Western Reserve Area Agency on Aging; Interned in Social Work for Cleveland Dept. of Aging and the Cleveland Clinic Marymount Hospital; Bonner Scholar, Oberlin College. Retired president of Forest City Land Group. Chair of Kendal Northern Ohio Board of Directors and Ohio Streams and Wetlands (formerly Ohio Wetlands Foundation); service to Lorain County Community College Foundation. Science Librarian, Oberlin College, since 1983; Past President, Academic Library Association of Ohio; Actively involved with numerous professional state and national library associations, and Oberlin College committees; Author of numerous professional reviews and articles; Received Academic Library Association of Ohio Jay Ladd Distinguished Service Award. Former Assistant to the President, Oberlin College; author; retired consultant in education, writing and fundraising; Extensive board service to Kendal (KatO; KNO-Senior Independence and The Kendal Corporation); Clerk of Oberlin Friends, American Friends Service Committee, Oberlin Early Childhood Center and Firelands Association for the Visual Arts. Financial executive and former Senior Vice President and Senior Investment Officer for Northern Trust; Senior Vice President and Managing Director for Key Asset Management Group of KeyCorp. Nonprofit board service for Old Stone Foundation and Music and Performing Arts at Trinity Cathedral. Kendal at Oberlin resident since 2012; Retired Executive Director of Development at the College of Wooster (35 years); Grace’s career began as an elementary school teacher. Significant volunteerism includes the American Cancer Society advocacy program; Ambassador for Congressional Districts in Ohio; Audiovisual Scheduler for all programs in Kendal’s auditorium; and Resident Ombudsman as a liaison for Construction Communication.